Cognition. Even psychics get it wrong. 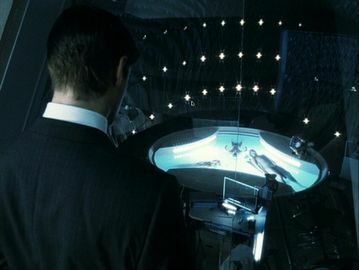 (Scene from the Minority Report). I recently pointed out that modern environmentalism correlates with rational and self-expression values. Since that post I have been thinking about the ‘why’. That is, why might we need these values? My tentative answer is that we need a rational, scientific mindset to move beyond the failures of human cognition. And, to the extent that this mindset is not prevalent among elites, we need a vibrant market place of ideas to speak truth to power. I shared these ideas with a few friends this week and found myself mostly talking about cognitive failures that limit progress in ocean conservation. I share with you today what I perceive as the top three offenders. There’s always disagreement between fishermen and government scientists about these issues [catch limits] because fishermen and scientists operate differently. Imagine an overfished area of the sea in the shape of a hockey field with nets at either end. The few fish left therein would gather around the goals because fish like structured habitats…The fishermen would make a beeline to the goals, catch the fish around them, and say the scientists do not know what they are talking about. The subjective impression the fishermen get is always that there’s lots of fish – because they only go to places that still have them. Confirmation bias is a “tendency for people to favor information that confirms their preconceptions or hypotheses”. Put another way, it is the problem that occurs when we do not challenge our beliefs. I think this has led to a problem of ideology on both sides of the ocean conservation divide. Wal-Mart announced this week its efforts to help fund the demise of both the recreational and commercial fishing industry while also working to ensure that the next generation of sportsmen will have less access to coastal fish stocks than at any point in U.S. history. Our oceans have been the victims of a giant Ponzi scheme, waged with Bernie Madoff–like callousness by the world’s fisheries…The scheme was carried out by nothing less than a fishing-industrial complex–an alliance of corporate fishing fleets, lobbyists, parliamentary representatives, and fisheries economists. But isn’t there better evidence that fishermen have acted quite morally considering the ‘ideology of abundance’ that pervaded fisheries management until relatively recently? After all, few people understood that global fish stocks were in trouble until the late-80s, early-90s. (Michael Weber is a good read on this). Shifting baselines is a term that describes how humans have a poor conception of how much of the natural world has been degraded by our actions, because of our short life-spans and faulty memories. Thus, what we see as pristine nature would be seen by our ancestors as hopelessly degraded, and what we see as degraded our children will view as ‘natural’. This term was coined by Pauly (can I mention him enough? ), expanded upon by Jackson and Knowlton, and even tested by a research team at Imperial College London. [T]he way we see the world, and the reason why we find some things intuitively easy to grasp and others hard, is that our brains are themselves evolved organs: on-board computers, evolved to help us survive in a world – I shall use the name Middle World – where the objects that mattered to our survival were neither very large nor very small; a world where things either stood still or moved slowly compared with the speed of light; and where the very improbable could safely be treated as impossible. [T]he ocean has an image problem. Only it’s not a problem in the typical sense. When we think “image problem,” we think Charlie Sheen. Or high fructose corn syrup. Or Congress…The ocean’s image problem, however, is of the opposite kind. When we go down to the shore and look out at the waves, do a bit of bodysurfing, maybe watch a blazing orange and pink sunset, then swing by the fish market and pick up a fresh, local, sustainable filet of something white and flaky to bring home and fry up in the pan, we don’t see what’s really taking place beneath the surface. We don’t notice the decades of habitat degradation from coastal development and polluted runoff. We don’t see the microscopic organisms struggling to build their shells and skeletons in acidified water that dissolves them almost as quickly as they grow. We can’t comprehend that the populations of fish and marine life we experience today are such a far cry from the teeming ecosystems considered normal by even our parents and grandparents. All the scientific analyses and drumbeats of overfishing and climate change notwithstanding, it’s hard to ask people to develop a different perception than what they see with their own eyes…Yet sometimes we must believe in the things we cannot see. “Yet sometimes we must believe in things we cannot see.” Very true, and an orientation to reason and science helps us get there. A little gem I thought relevant to your shifting baselines concept. If only we could get people to think on broader scales, the environment might stand a chance. I recently wrote about people killing snakes and while doing so kept hitting up against the idea that some gap in human thinking must exist for so many to believe it’s okay and even necessary. I got stuck there, though, not knowing enough about psychology to know where to start. Your post has been very enlightening! Thanks for sharing!